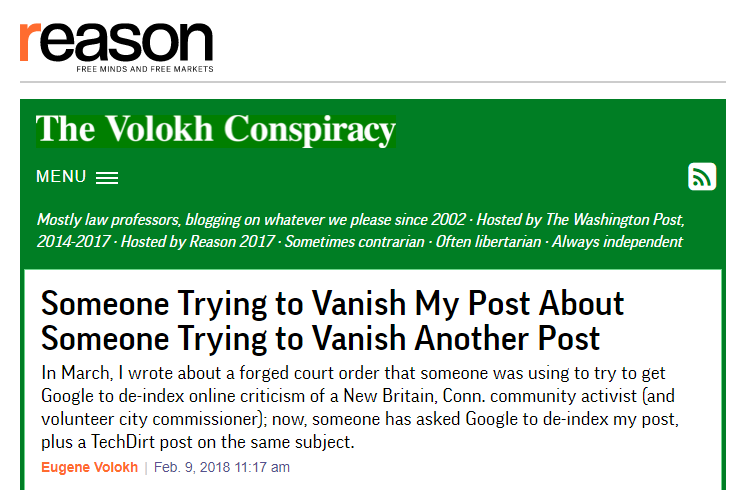 Earlier this week, I blogged about an anonymous defamation takedown request of articles by The Washington Post and Techdirt re: forged court orders intended to force Google to deindex links. 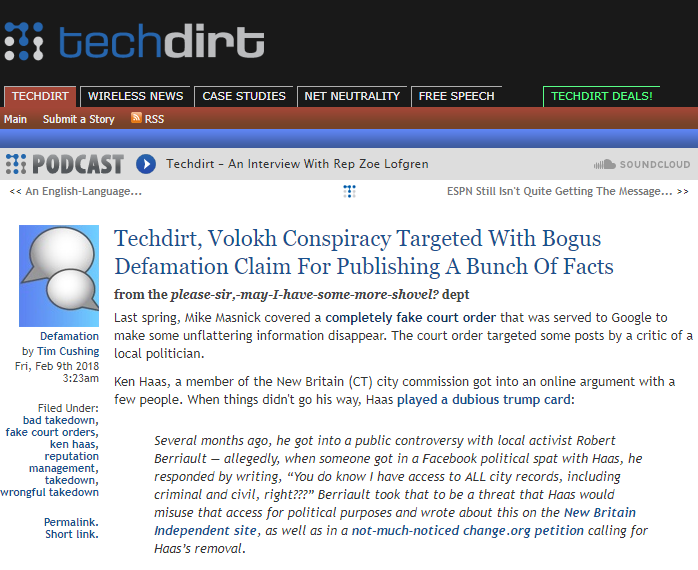 Yesterday, Techdirt and The Volokh Conspiracy hoisted the mystery complainant. Last spring, Mike Masnick covered a completely fake court order that was served to Google to make some unflattering information disappear. The court order targeted some posts by a critic of a local politician. Several months ago, he got into a public controversy with local activist Robert Berriault — allegedly, when someone got in a Facebook political spat with Haas, he responded by writing, “You do know I have access to ALL city records, including criminal and civil, right?? ?” Berriault took that to be a threat that Haas would misuse that access for political purposes and wrote about this on the New Britain Independent site, as well as in a not-much-noticed change.org petition calling for Haas’s removal. Invaluable scourer of the Lumen database, Dean Jones, points out another bogus attempt to delist online content has been made — targeting posts at both Techdirt and the Volokh Conspiracy. Now it emerges that an anonymous complainant has sent Google a defamation complaint requesting the removal of the two articles from its search results, citing a 1979 Supreme Court case concerning the public disclosure of personal information. Yes, this one is styled as a defamation takedown request, even though both articles are factual and contain receipts. The takedown notice cites a Supreme Court decision that has nothing to do with either post, despite the claims made in the notice. Who submitted the forged order to Google? Commissioner Haas seems the likeliest intended beneficiary of the forgery and the takedown request, and his name (spelled as Ken Hass) was used on the takedown request. But it is of course possible that this was done by someone else, whether someone hired by Haas (with or without knowledge of what would be done) or someone else. I called Haas back in March to ask about what happened here, but he told me he had no comment. Then I wrote about this on the blog, hosted at the time at the Washington Post; TechDirt covered it as well. The New Britain Progressive covered it as well, and then mentioned the incident again in December, as part of its “Top 10 of 2017” retrospective. A week later, someone submitted a deindexing request to Google asking it to vanish my original Washington Post item and the TechDirt piece. In 1979, the U.S. Supreme Court recognized an individual interest in the “practical obscurity” of certain personal information. The case was DOJ v. Reporters Committee for a Free Press. As well, this information is harmful to me as it concerns unfounded information which never resulted in prosecution. Not only has the dissemination of this information never been legitimate, but its internet referencing is clearly harmful to my reputation as my professional and personal surroundings can access it by typing my first and last names on the Internet. Fortunately, Google has not deindexed TechDirt’s or my posts in response to this request, and I’m confident that it won’t. But I thought it was worth noting that there has been indeed an attempt to vanish this story. The full articles are available to read by clicking here and here.